We've had a bit of a love / hate relationship with the Google Chromebook since the first one crossed our laps back in 2011 -- the Samsung Series 5. We loved the concept, but hated the very limited functionality provided by your $500 investment. 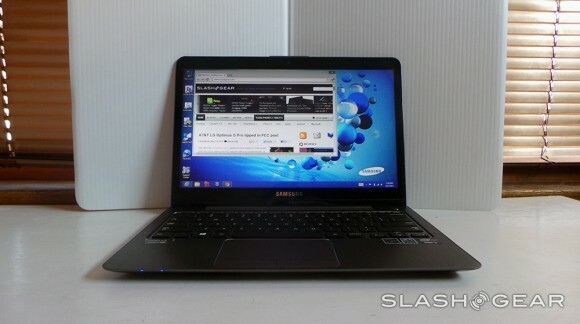 Since then, the series of barebones laptops has progressed, and so too has the barebones OS they run, leading to our current favorite of the bunch: the 2012 Samsung Chromebook. In that laptop's review, we concluded that "$249 seems like an appropriate price for this sort of device." So, then, imagine our chagrin when Google unveiled a very similar sort of device, but one that comes with a premium. A very hefty premium. It's a high-end, halo sort of product with incredible build quality, an incredible screen and an incredible price. Is a Chromebook that starts at more than five times the cost of its strongest competition even worth considering? Let's do the math. Wow. This is certainly a departure. If you're going to charge an obscene premium for a laptop with an incredibly limited OS, you'd better produce something that is incredibly well-made. In that regard, the Chromebook Pixel is a complete success. If you'll forgive us just one cliche, Google has gone from zero to hero with the Pixel. It's truly something to behold. First impressions are of a laptop with surprising density. Apple's MacBook Pros, with their precisely hewn aluminum exteriors, have long been the benchmark against which other laptops were held in when it comes to a sense of solidity. In its first attempt, Google has managed to match that feeling of innate integrity with the Pixel, and in some ways go beyond it. It's all machined aluminum, anodized in a dark, almost gunmetal color that successfully bridges the gap between sophisticated and cool. Everything is very angular; vertical sides terminate abruptly at the horizontal plane that makes up the typing surface. In fact, the only thing not bridged by right angles is the cylindrical hinge running nearly the entire width of the machine, but thankfully the edges of the entire laptop are just rounded enough to keep it from digging into your wrists uncomfortably. Battle scars received while typing have become a bit of an annoyance in many modern, aluminum-bodied machines. A good, quick test of a laptop's rigidity is to open it up, grab it on both sides of the keyboard and try to twist. On a flimsy product you'll hear some uncomfortable-sounding noises coming from beneath the keys and, if you're really unlucky, you might send a letter or two flying. Not so with the Pixel. The torsional rigidity is impressive for a machine that is as thin, and as light, as this. 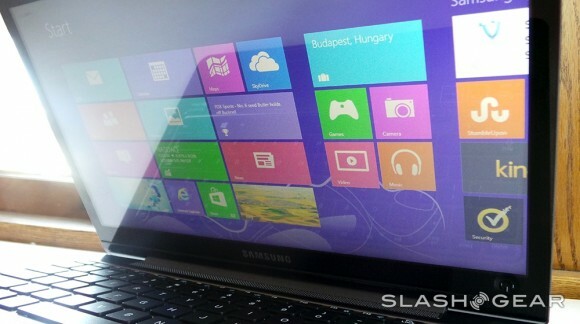 To put some numbers on that, the laptop measures 16mm (0.62 inch) in thickness and 3.35 pounds (1.52kg) in heft. That compares very favorably to the 13-inch MacBook Pro with Retina, the one that we would most closely pit this against, which is 19mm (0.75 inch) thick and weighs 3.57 pounds (1.62kg). So it's thinner and lighter, and with a very similar 12.85-inch, 2,560 x 1,700 display (which we'll thoroughly discuss momentarily), but with lower performance. It is, however, on par with the 13-inch MacBook Air when it comes to speed, and is only slightly thicker (0.06 inch) and heavier (0.39 pound). A dual-core Intel 1.8GHz Core i5 chip is the one and only processor on offer here, paired with 4GB of DDR3 RAM and generally providing more than enough oomph to drive the very minimalist operating system, which is installed on either a 32 or 64GB SSD. The larger option is only available if you opt for the $1,449 laptop, which also adds Verizon-compatible LTE to the mix (along with GPS). Either model sports dual-band MIMO 802.11a/b/g/n along with Bluetooth 3.0. For those who like to keep it physical, there are two USB ports on the left (sadly just 2.0) situated next to a Mini DisplayPort and a 3.5mm headphone jack. On the right is an SD card reader, along with the SIM card tray -- assuming you paid for the WWAN upgrade. For those who aren't interested in making use of that headphone jack, there are what Google calls "powerful speakers" built in here -- though they're hard to spot. They're integrated somewhere below the keyboard and, believe it or not, that "powerful" description is quite apt. You won't be giving your neighbors anything to complain about if these are cranked to maximum volume, nor do you need to concern yourself about cracking the masonry thanks to the bass, but the output here is respectably loud and good-sounding. These speakers are at least on par with your average mid-range Bluetooth unit, meaning you'll have one less thing to pack. For the receiving end, Google has also integrated an array of microphones throughout the machine to help with active noise cancellation, including one positioned to detect (and eliminate) keyboard clatter when you're typing whilst in a Hangout or the like. Without the ability to selectively disable this microphone we can't be sure how great an effect it had, but we can say that plenty of QWERTY-based noise got through in our test calls. Google, though, has indicated it will continue to refine the behavior of that mic, so there's hope for improvement. Integrated in the bezel is a webcam situated in the center-top of the bezel, next to a small status LED to let you know when Big Brother is watching. One final piece is the power plug, a largish wall wart that takes a cue from Apple by including a removable section. Here you can slot in either a flip-out, two-prong end or a longer, three-prong cable. The inspiration is obvious, but we're not complaining. This lets you have both a short, easy-to-pack version when you're traveling light and a longer but rather more clunky version for those times when you need a bit more reach. We do, however, wish Google had also taken inspiration from Apple and Microsoft and included some sort of magnetic power connector. We found that the small plug, with its traditional, single-prong-style connector, had a tendency to slowly work its way out of the laptop when the cable had any tension from the left. Thankfully, a bright glowing light on the connector lets you know when the laptop is charged or charging -- and thus when the thing has slid out far enough to lose connection. Island-style keyboards continue to be all the rage and, for the most part, Google makes no exception for its latest Chromebook. The primary keys float in a slightly recessed area, comfortably sized and comfortably spaced. Each has great feel and great resistance. Typing on this machine is a joy. However, the row of function keys that rest atop the number keys, discrete buttons for adjusting volume and brightness and the like, is a different story. These are flush with each other and far stiffer than the normal keys. This isn't much of a bother, since you won't be using them nearly as frequently as the rest, but butting them right up against each other makes them difficult to find by touch. Thankfully, all are backlit, so locating them in the dark is no problem. We also wished for dedicated Home and End keys, after finding the Chrome OS alternative of Ctrl + Alt + Up or Down to be a bit of a handful. Regardless, you'll quickly learn to type around these relatively minor shortcomings and enjoy the great keyboard. Thankfully, the trackpad is equally good. It's a glass unit, darkly colored and positioned in the center of the wrist rest, which makes it slightly shifted to the right compared to the space bar. It has a matte coating but still feels quite smooth, resulting in a very nice swiping sensation indeed. Of course, with a 12.85-inch touch-sensitive display, you may find yourself using it less frequently than you think. Again, up top is a 12.85-inch, 2,560 x 1,700 IPS LCD panel that we can't look at without thinking of the very similar 13.3-inch, 2,560 x 1,600 panel on the 13-inch MacBook Pro with Retina display. It's smaller but packs an extra 100 pixels vertically, giving it a slightly higher pixel density of 239 ppi. Naturally, that's far from the full story here, and those who are really into proportions will know that resolution equates to a 3:2 aspect ratio. In other words: it's rather tall. A 16:9 aspect ratio (or something close to it) is the prevailing trend among non-Macs these days, but even when acknowledging that, this one feels particularly tall. Still, we didn't exactly mind it. As mentioned above, the keyboard is plenty roomy, and given that Chrome OS isn't particularly friendly to multi-window multi-tasking (manually justifying windows is a real chore) we were rarely left wanting a wider display. That was, really, our only minor reservation about this panel. Otherwise we have nothing but love for the thing. It is, of course, a ridiculously high resolution, which makes pixels basically disappear. Indeed the simple, clean and stark Chrome OS looks great when rendered with such clarity, but we couldn't help but lament the occasional excess of white space that's becoming common across many of Google's web apps. For a display with a pixel density this high, it feels somewhat under-utilized. That is until, of course, you boot up the 4K sample footage Google thoughtfully pre-installed on the machine, which looks properly mind-blowing -- even if it is only being rendered at slightly higher than half its native resolution. This is a glossy panel, tucked behind a pane of Gorilla Glass, so glare may be a bit of a problem if your work setup has bright lights positioned behind you. Still, reflectivity seemed to be on par with the latest, optically bonded panels -- that is to say, far from the "mirror, mirror" effect provided by many of the earlier gloss displays. Contrast is quite good from all angles, though the color accuracy drops off if you look at it from too high or low, with everything quickly getting a bit pink. Slightly pretty. And, finally, this is indeed a touch-enabled panel, something we didn't know we needed on a Chromebook -- and frankly we're still not sure we do. We'll discuss that in more detail in the software section below. Again we're dealing with a 1.8GHz Intel Core i5 processor here, a bit on the mild side compared to most higher-end laptops. Still, it proves to be more than enough to run the lightweight Chrome OS. That's paired with 4GB of DDR3 RAM and, predictably, integrated graphics courtesy of Intel's HD 4000 chipset. It's no barnstormer, but it runs a browser with aplomb. And, really, that's about all it's likely to do with the limited selection of apps available for Chrome. Everything we threw at it ran fine, though after extended sessions we did notice heavier websites started to get a little bit stuttery. It's nothing that rebooting the browser didn't fix. High-def videos play smoothly, though when pushing the pixels (or running games), the machine does get fairly warm. The fan vents are below the hinge; a thin sliver of an opening that thankfully doesn't seem to dump a lot of hot air into your lap. It's noticeable, but it isn't particularly loud or annoying and again, since you likely won't be doing too much taxing stuff here, don't expect to hear it all that often. When it comes to battery life, Google estimates the 59Wh battery will provide "up to" five hours of continuous use. And, indeed it may. On our standard battery run-down test, which loops a video at fixed brightness, the machine clocked in at four hours and eight minutes for the WiFi model. The LTE model, with its LTE antenna on, came in about 30 minutes shorter at 3:34. These numbers are rather poor, unfortunately. The 13-inch MacBook Pro with Retina clocks in at more than six hours on the same battery test, while both the 13-inch MacBook Air and the latest Samsung Chromebook score about 30 minutes more even than that. As mentioned above, both Chromebook Pixel models include dual-band MIMO 802.11a/b/g/n, which means you'll be sucking down bits at an optimal rate more or less regardless of what sort of router you're connecting to. Stepping up to the $1,449 LTE version of course means you can walk away from those routers. That machine includes a Qualcomm MDM9600 chipset to receive on LTE band 13, intended for Verizon in the US only. So, then, we tested it in the US in two different LTE markets on both coasts. Speeds varied widely from location to location, but in general matched or exceeded the speeds we saw from other Verizon-compatible mobile devices. In terms of more practical connectivity concerns, it's worth noting that the modem takes about 30 seconds to reconnect after the laptop resumes from its suspended state, which is a bit annoying but certainly no slower than your average LTE USB modem. Also, Verizon is kindly including 100MB of data each month for free for your first two years of Chromebook ownership, but after that you'll be stuck paying up for one of Verizon's tiered data plans. Oh, and the Pixel lacks an Ethernet port, and does not include an adapter. We tried a few standard USB Ethernet adapters and all worked without a hitch. As we concluded in our review of the most recent version, Chrome OS has come a long, long way since that first Chromebook crossed our laps. What we have now is a far more sophisticated and comprehensive experience than we did a few years ago, but it's still incredibly limited compared to the broader world of desktop operating systems. Simple tasks like file management can be a real chore if you're doing anything other than moving a file into a subdirectory. And while the OS itself has a refreshingly simple visual style, it's also very stark and, frankly, a somewhat wasteful design. Not to keep harping on the file explorer, but each file in a list is separated by a sea of white big enough to basically double the effective height. When you're skimming through a big 'ol list of files in a directory, it takes a lot more scrolling than should be necessary given the resolution of this display. At least Google made the scrolling easy. As mentioned above, the trackpad is quite good and very responsive. Multi-finger gestures are responsive, so good that you might not be inclined to reach up to that touch panel. But, you should, because the experience is generally good as well, though you'll rarely be doing anything more than scrolling webpages or documents. There's not really a whole lot more Chrome OS can do, but even in games like Cut the Rope and Angry Birds, touch was just as good as... well, as it is on an Android tablet. That said, it's disappointing that Google didn't introduce any gestures to the OS to match its newfound touch compatibilities. In fact, you can't even pinch-zoom in the image viewer or even on most pages in the Chrome browser -- only in specifically pinch-friendly websites (like Google Maps). There are no three- or four-finger gestures for switching apps, and swiping in from the bezels does nothing. Except, that is, for a swipe up from the bottom, which alternatively shows or hides the launcher bar. Again, we won't restate the entire review of Chrome OS, but it's important to note at least briefly that functionality here is still very minimal. There are built-in apps for viewing photos and videos, for browsing files, for taking photos from the integrated webcam, an app for taking notes and... the web browser. That, of course, is the most important part. Suffice to say, if you can't do all your work from inside of an instance of Chrome on some other platform (like Windows or Mac), you probably won't be able to do it here, either. Still, we did want to point out one important part of the software, and that is it's easily replaceable. The bootloader is not locked and we've already seen the thing rocking Linux -- and looking quite good while doing it. So, if you happen to be looking for an incredibly well-designed laptop to run that most noble of open-source operating systems, this could be it. We can keep the pricing bit short, because there are only two options here. For $1,299, you can get yourself the WiFi model with 32GB of local SSD storage. For $1,449 you step up to the LTE model, which throws in 64GB of storage in a bid to sweeten the deal. Should that still be too bitter for your tastes -- and we're thinking there's a very good chance it will be -- Google has included plenty of other incentives that are at least mildly saccharine. First among these are 12 free Gogo passes for in-flight connectivity, each one worth about $14 for a total of $168. The other, rather more compelling add-in, is 1TB of online storage free for three years. That, believe it or not, is worth a whopping $1,800, which of course means that if you were looking to rent that much data for a period of three years you'd actually be better off just buying a Pixel. It would, effectively, just be a nice, free toy. For everyone not interested in storing copious quantities of stuff in the cloud, both price points are rather dear to put it mildly. As ever, it's difficult to compare a Chromebook to other laptops on the market thanks to the limited functionality provided by the OS. So, we'll focus primarily on hardware comparisons, and as we mentioned above, we find ourselves inclined to compare this to the 13-inch MacBook Pro with Retina display. That machine, with a full operating system and a faster, 2.5GHz Core i5 processor, starts at $1,499. That, though, has a 128GB of SSD, twice that of the biggest Pixel. We could also see many comparing this against the 13-inch MacBook Air, which offers the same CPU, integrated graphics and 4GB of RAM for the same $1,199. It's lacking the high-res screen but it perhaps makes up for that with, again, 128GB of storage. On the PC side of things, that resolution is unmatched, but the other specs certainly aren't. We recently had reasonably good feelings about Samsung's Series 5 UltraTouch, a 13-incher packing a similar Core i5 CPU, 4GB of RAM, but again a 500GB platter-based hard disk. An SSD isn't an option, but the $849 price is certainly more palatable. Again, none of these is an apples-to-apples comparison, as the Pixel offers a touchscreen, something all the Macs lack, and offers LTE connectivity, thus making it even more of a rare bird on the laptop scene. Whether these unique attributes, plus the various goodies Google is throwing in, turn this into a compelling proposition compared to the competition is something you'll have to decide for yourself. Again we reach the dreaded wrap-up section on a Chromebook review. It's simply never easy to classify these machines. In some regards, the Pixel is even harder to pigeonhole than its predecessors. The level of quality and attention to detail here is quite remarkable for what is, we'll again remind you, Google's first swing at building a laptop. Boot-ups are quick, performance is generally good and, of course, there's that display. But, with one single statistic, Google has made the Chromebook Pixel even easier to write off than any of its quirky predecessors: price. For an MSRP that is on par with some of the best laptops in the world, the Pixel doesn't provide anywhere near as much potential when it comes to functionality. It embraces a world where everyone is always connected and everything is done on the web -- a world that few people currently live in. The Chromebook Pixel, then, is a lot like the Nexus Q: it's a piece of gorgeous hardware providing limited functionality at a price that eclipses the (often more powerful) competition. It's a lovely thing that everyone should try to experience but, sadly, few should seriously consider buying. A few months after the iPad came out, computer makers who had made convertible laptops started phasing them out, believing the iPad usurped their need. What's old is new again: several computer makers are planning to introduce new Windows 8 convertible laptops soon after Microsoft makes the OS official on October 26. I agree with the assessment that the iPad stymied the need for convertible laptops; if you need a keyboard with the lighter-than-a-convertible iPad, or even an Android tablet, you could buy an auxiliary Bluetooth QWERTY keypad. In fact, your bag would probably be lighter with an iPad and an ultrabook both contained therein, as opposed to a single convertible laptop. But if these new hybrids succeed, we can't keep calling them "convertible laptops" (for one thing, it takes too long to type). So, I'm inventing a new name for these sometimes-a-laptop, sometimes-a-tablet combo computers. Here's the convertible rundown on the five laptabs I found during last months IFA electronics showcase in Berlin, Germany — some have sliding tops and some have detachable tabs, but they're all proper laptabs. 1. Dell XPS Duo 12 It looks like a regular clamshell at first glance, but the 12.5-inch screen pops out and swivels 360 degrees on its central horizontal axis inside the machined aluminum frame, then lies back-to-front over the keyboard to create one fat tablet. The idea isn't exactly original — the company put out a 10.1-inch Inspiron Duo netbook a few years back with the same swinging configuration, but was discontinued when the iPad also killed the netbook. 2. 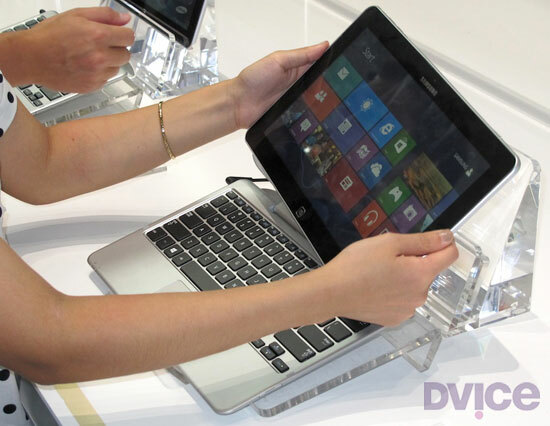 HP Envy X2 Here's a detachable tablet laptab with an 11.6-inch snap-off screen. Combined with its keyboard, the X2 weighs a whopping 3.1 pounds; the separated screen/tablet tips the scales at just 1.5 pounds. 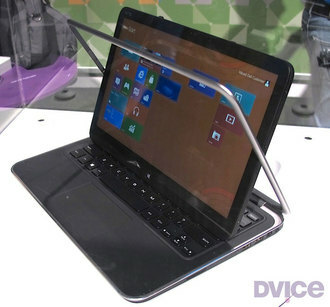 Its heavier-than-thou nature stems from HP building a battery into both the X2's keyboard and the screen/tablet. 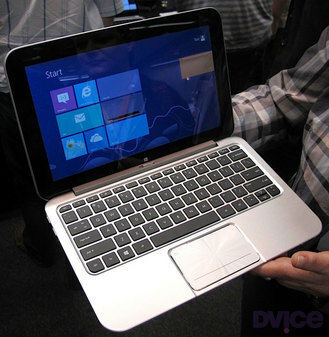 HP didn't have a battery life rating, only saying the dual configuration meant it will be naturally massive. 3. 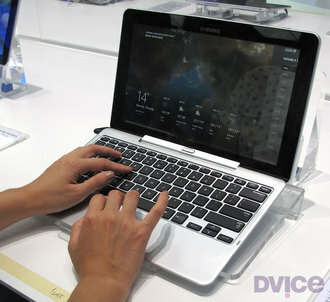 Samsung ATIV Smart PC/Smart PC Pro Like the HP, Samsung's offering has an 11.6-inch screen that pops off the QWERTY keypad. The Pro sports an Intel Core i5 processor, measures 11.9 mm thick when closed and will run for eight hours on a single charge, while its sibling is endowed with an Intel Core i3 chip, measures a relatively svelte 9.9mm thin and operates for a healthy 13.5 hours on its battery. 4. 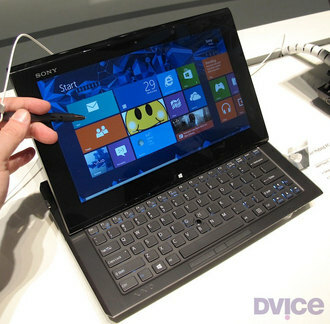 Sony VAIO Duo 11 Isn't it odd that Sony and Dell came up with similar laptab appellations? Or maybe not. The VAIO Duo 11 is equipped with an 11.1-inch touchscreen that slides flat-then-back-to-front so it lies back-down on top of the keypad. You also get a digitizer stylus. Sony's Duo doesn't offer any weight advantages compared to an ultrabook, though, which I think poses a problem for most of these laptabs. For instance, both the Intel i3 and i5 Duo 11 editions weigh in nearly a half pound more than Apple's 11-inch Mac Book Air, and at 2.86 pounds, just 0.1 pounds lighter than the 13-inch MacBook Air. 5. Toshiba Satellite U920t Like the Sony Duo, the Satellite U920t is a back-to-front slider, but lacks the seemingly overly complex mechanism of its sliding laptab competitor. Instead, you lay the U920t's 12.5-inch screen flat, then slide it over the keyboard. While easier to slide, it's a bit thick at 19.9 mm compared to Duo 11's 17.8 mm depth, and weighs a heftier 3.2 pounds. 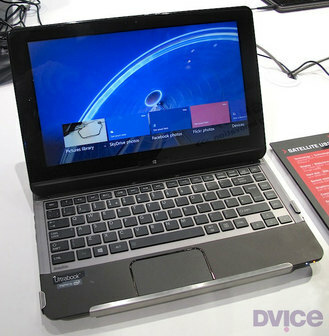 So: a light ultrabook, or a heavier laptab? And once you pop the tab top off the HP and Samsung when mobile, your bag continues to be weighed down by the keyboard, obviating the whole advantage of carrying a tablet. In other words, laptabs carry all the disadvantages of a heavier laptop with none of the weight advantages of a tablet. Perhaps there are some functionality advantages by having both; I just don't see these worth a sore back. Check out the gallery below for a closer look at each laptab written about here. All images above by Stewart Wolpin for DVICE. Asus’ Transformer (and Transformer Prime) seems to have resonated well with consumers, and now Microsoft may be looking to create a similar concept in the future. A new patent reveals Microsoft nurturing an idea that could see a tablet turning into a full fledged laptop or desktop PC, complete with not one but two separate processors. How is that any different from the Transformer Prime, you ask? Unwired View reports that Microsoft would be including a processor not only in the tablet itself, but also the keyboard base unit. The processor in the tablet would be optimized for low-power, pointing towards an ARM chip of some kind, while the processor in the keyboard base unit would be focused more on performance. That could mean either a speedier ARM chip, or even an ULV Intel chip. Right now with the Transformer Prime, you hold the same amount of processing power whether or not you’re docked with the keyboard, which only provides additional power. Microsoft’s vision would see different performance scenarios depending on your mobility requirements, which seems much more appealing. Not only that, the operating system would adapt to the change. 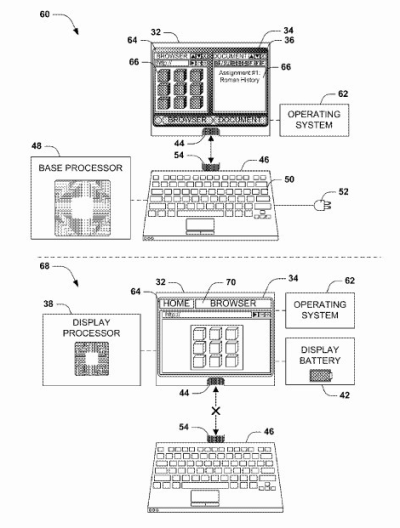 Microsoft lay out in their patent that the device would switch between a “resource-conserving computing environment” when in tablet mode, and a “resource-intensive computing environment” when in laptop mode. This is idle speculation, but that sounds ideal for Windows 8, switching to the Metro interface when in tablet mode, and back to the traditional desktop when in laptop mode.